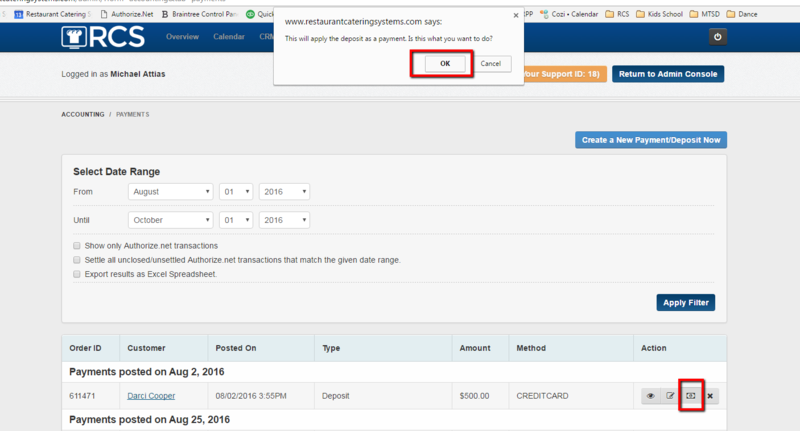 In this article you will learn how to apply a deposit as a payment through the Payment link found under the accounting tab. 1 - Click on the Accounting tab and then the Payments link. 2 - The next screen that appears looks like this. You can search by date range as well. When looking at a specific invoice you can: view the invoice, edit the invoice, apply the deposit or delete the invoice. 3 - If you want to apply the deposit you will click on the apply the deposit icon and a pop up screen will appear making sure this is what you intended to do. You will get a notice that the deposit has been applied and the apply deposit icon will no longer appear. Your deposit has now been applied as a payment.